It’s 102 degrees out — or it was the last time I checked, which was at 11:30 this morning. With a massive July heatwave affecting at least half of the lower 48, one’s thoughts naturally turn toward any kind of food that requires no cooking. 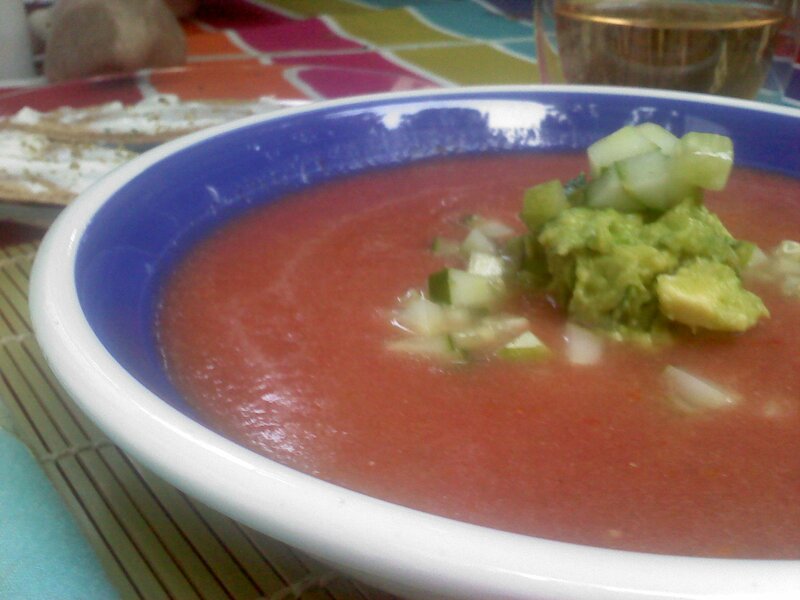 Thank God for gazpacho. 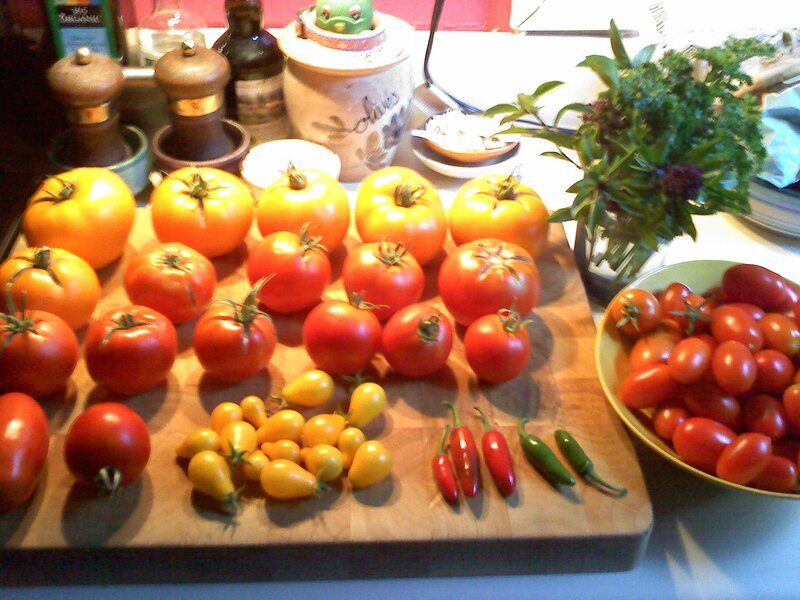 My kitchen counter is overflowing with tomatoes this summer. Time for gazpacho! Because it’s July, I also have a bumper crop of tomatoes in my garden which need to be eaten in copious quantities on a daily basis before they rot on the kitchen counter. I could, of course, also slice them and put them outside to sun-dry so that I can relish in their intense flavors when the snow begins to fly, but, honestly, I don’t want to go out there. It’s too hot, even for this Florida girl. Gazpacho is, of course, so easy to make that I am embarrassed to bring it up at all, but I have learned that sometimes the simplest recipes are the ones that people are afraid to make. A basic gazpacho requires no more than a blender and a lot of tomatoes — you can pretty much do anything you want with it at that point. You’ll also see fancy bistros touting dishes like White Grape Gazpacho on their sidewalk chalkboards, so, if you’re so inclined, go ahead and experiment. 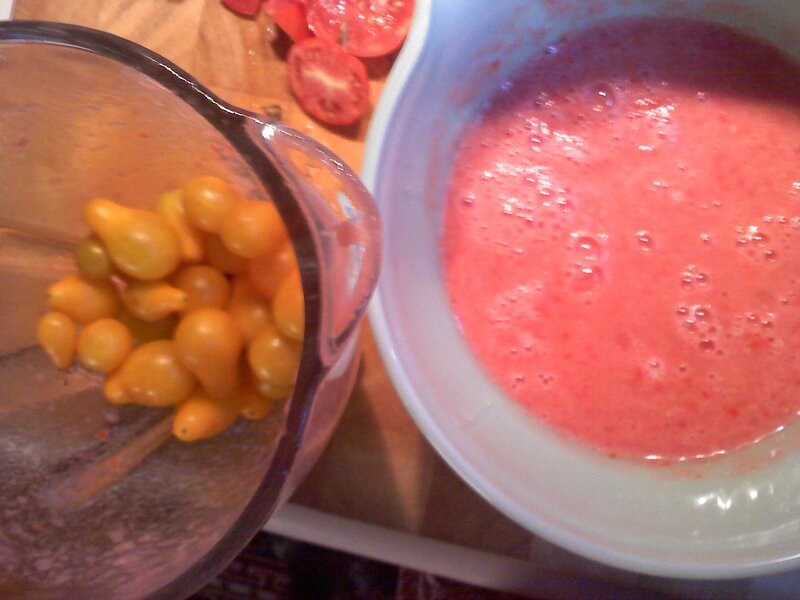 On the left, golden pear tomatoes in the blender; on the right, a variety of red tomatoes pulsed into submission. However, tomatoes are generally cheap and plentiful this time of year, not to mention incredibly flavorful and refreshing on a seriously hot day. There are basically two types of gazpacho — chunky or smooth, rather like peanut butter. The chunky version is generally tomatoes, onions, and cucumbers (and salt and pepper), pulsed in a blender to a loosely chunky consistency. Just chop ’em up and throw them in, skins, seeds, and all. I call this my Bloody Mary Gazpacho, which I made with red tomatoes, celery, and cucumber and a touch of Tabasco. Topped with a chunky celery leaf guacamole and cucumbers that were briefly marinated in apple cider vinegar. The smooth version is pretty much the same, only blended to a smooth consistency and then strained through a sieve. I personally like to make the smooth version, because it makes a lovely cold soup to which I can then choose to add more chopped veggies, including tomatoes, cukes, and zucchini, as well as chopped fresh herbs such as basil, dill, parsley, or oregano. It’s a nice touch to add a dollop of creme fraiche or Greek yogurt to serve as a creamy yet tart counterpoint to the sweetness of the tomatoes. Yellow Tomato Gazpacho, inspired by the amazing version at Busboys and Poets, one of my favorite DC restaurants. 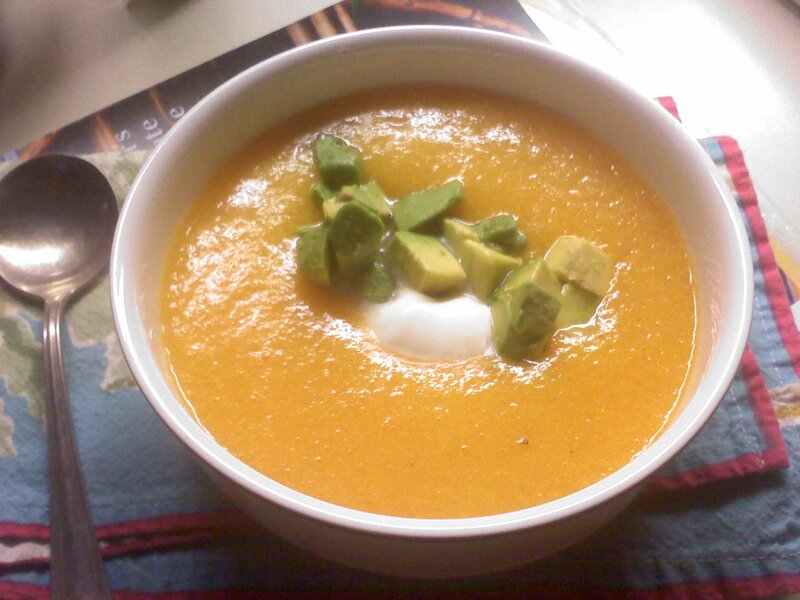 I kept the soup simple and focused on the sweetness of the yellow tomatoes, then topped it with chopped avocado and a spoonful of labne (a Middle Eastern thickened yogurt). You’ll want to let the gazpacho chill in the refrigerator for at least an hour before serving; it’s so easy to make that you can blend it up before work — or going to the pool — and then enjoy its lovely refreshing coolness when you get home. A perfect pick-me-up when you are soggy and wilted from an overdose of global warming. I am cheating a bit this week and am sending my readers to check out a terrific blog post that was written by a high school girl in my neighborhood who is spending a semester as an exchange student in Paraguay. I’ve known Ann Elise since she was probably about five years old — she’s smart, friendly, and pretty spunky, too, judging by how fearlessly she seems to be embracing a very different life in Paraguay. She is blogging for her friends and family about her life in another hemisphere and it is very engaging reading. I was, of course, especially captivated by a post she did all about food; it’s possible that the local food may be one of the biggest culture shocks for Ann Elise, as it might be for many American foodies — and for any kid who grew up on Capitol Hill, where the farmer’s market at Eastern Market, overflowing with fresh produce, is central to the community. 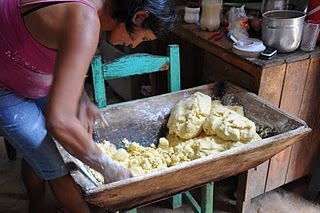 As she notes, the people of Paraguay eat a lot of meat and carbohydrates, which are plentiful and cheap, and not much in the way of fruits and vegetables, which are pretty expensive. They also eat several small meals throughout the day besides a large midday meal, with a salty snack in the midmorning and a sweet snack in midafternoon. Having grown up in hot climates, this sounds pretty familiar to me. In Paraguay, Ann Elise is having an empanada for her salty snack — in Florida, we were more likely to have french fries from Wendy’s, dipped in mayonnaise. Not to be indelicate, but you sweat a lot when you live in a hot place and that salty snack is essential to keeping your body in balance. Ann Elise’s sweet afternoon snack generally features dulce de leche (caramel); as I wrote in an earlier post, when I was a child in the West Indies, our midafternoon snack often consisted of a can of sweetened condensed milk, which is not that different. I heartily approve of Ann Elise’s preferred method of eating dulce de leche — all by itself, with a spoon! Why mess with perfection? I’m hoping that Ann Elise will bring back recipes and give her neighbors some hands-on lessons when she gets home — she seems to be pretty skilled at making “chipa” now! A scene from Admiralty Bay taken in 1966, just a few years before I first skipped along that same beach. There’s a point when driving across the St. Mary’s River from Georgia into Florida when the sky suddenly spreads out across the marshes and the air becomes faintly scented with cocoa butter and orange blossoms and I realize that I am home. Never mind that I still have another three hours on the road to get back to my actual home — Cocoa Beach — but hurtling down I-95 past the clumps of palmettos and Ron Jon’s Surf Shop billboards (“World’s Largest”), I feel that lift in my spirits that tells me that I am back where I belong. It is funny that I feel that way, because I have no desire to live in Florida again, but I am living proof that once a beach girl, always a beach girl. No matter where I live, I always feel somehow most like myself when I have sand between my toes and a slight crust of salt on my skin. This feeling goes back to when I was 5 years old and my mom packed me up in the dead of a frigid New York City winter and bundled us onto a plane to the West Indies. I remember pulling on heavy tights and a wool jumper and a sweater in the pre-dawn chill and a few hours later I was blinking in the raw sunshine of Barbados. My mother bought me a pretty flowered sleeveless shift dress in the airport and, as I stripped out of my winter woolens, I remember that sudden sense of total freedom, the silky feel of the breeze on my bare arms, the Crayola box kaleidoscope of colors — sky, water, plants, people — that seemed to wrap me up in a new kind of warmth. 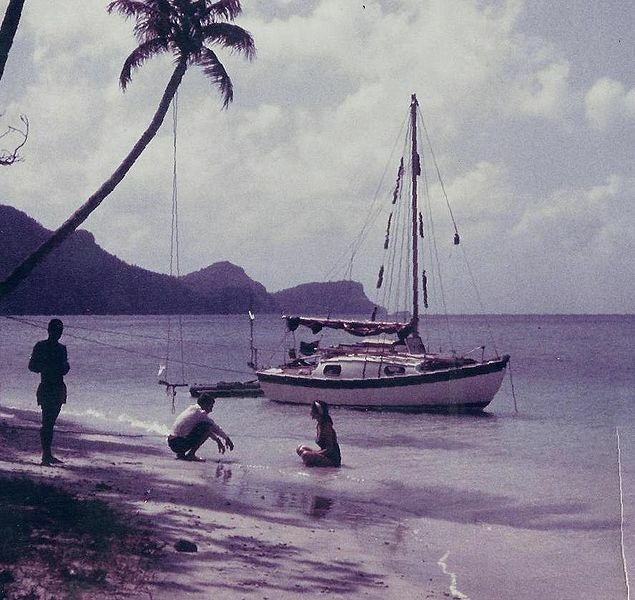 We ended up eventually on the tiny island of Bequia, after another plane ride to St. Vincent, and then a mailboat trip across the Caribbean Sea to Admiralty Bay (which my mother still describes as a terrifying journey, mainly because I clambered all over the place like some monkey escaped from the zoo). From that point, it was a short walk along the beach to our hotel, but it felt like we were a million miles from anywhere. Life suddenly felt as slow as maple syrup drooling down a stack of pancakes, yet each moment was more intense, as if I had been sleepwalking and was now wide awake in Paradise. The flavors of the Caribbean are notably intense and are a perfect melding of many cultures: African, British, French, Dutch, South American. At that time, the cuisine was the essence of what we call today “slow food”, which is to say that most everything was local because it was too difficult to transport food from one place to another. The only thing I really ever remember eating that wasn’t something that could be caught from the bay or picked from a tree was sweetened condensed milk, cans of which would be tossed out to all of us kids as we ran barefoot across the island together each day. We’d crack the top open and crouch in the shade of crabapple trees, dipping our fingers into that creamy sweet goodness and noisily slurping in an ecstasy of delight. I spent portions of three years on Bequia with my mother and the food of that time permeated our meals forevermore, in one way or another. My mom is an amazing cook and would often become fascinated with certain cuisines, especially French, Greek, and Italian, and her Caribbean cookbooks are well-worn and filled with her pencilled notations regarding proportions or possible substitutions for ingredients not easily obtained in the United States. 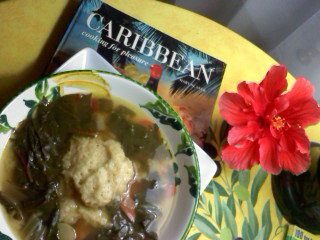 So, on my recent Spring Break visit to my folks’ house in Cocoa Beach, I found myself pouring through the old cookbooks and thinking with great fondness of callaloo. Callaloo refers to the dark green leaves of the taro plant — imagine collard greens or swiss chard in texture. The flavor is somewhere between spinach and mustard greens, smooth with a slightly peppery undertone. Callaloo soup is a true Caribbean staple, although it can be made a hundred different ways, depending upon where you are and what ingredients are available that day. It might include ham or crab or both, it could have coconut milk and conch, or it might have okra or tiny potatoes or even rice. In general, it is light and refreshing, even on the hottest day close to the equator. I was challenged to figure out how to make this vegetarian version — if you want to try something more authentic, you can find many recipes on the internet, along with the complete lyrics to the Jimmy Buffett song of the same name. No matter what version you make, you might want to try spinning a little calypso on the CD player during your meal and maybe topping things off with a can of sweetened condensed milk. Just wash your hands first. Yes, I call it “mock” because callaloo is just not readily available in the U.S., but if you are lucky enough to find the real thing, then go for it! My version calls for delicate nutmeg-scented dumplins (that’s Caribbean for “dumpling”), which give the soup just a bit more substance for dinner. Heat 2 TB of olive oil in a stockpot over medium heat. Add the onion and cook, stirring frequently, until it begins to soften, about 5 minutes. Add the “ham” and stir well. Reduce heat and allow to cook for another 10 minutes, stirring frequently. Add the okra (or potatoes) and garlic and stir well, then add the stock and wine. Bring to a boil, then add the chard and reduce heat to simmer. Add the parsley and thyme and allow to simmer for 30 minutes. Add salt and pepper to taste and stir the butter in until it melts. Mix together dry ingredients, then cut in butter with a fork or your fingers until the mixture resembles cornmeal. Beat together the egg yolk and milk and mix with the dry ingredients to form a soft dough. Drop into the simmering soup by the spoonful — you should have enough for six decent-sized dumplins. Cover and allow to cook for 10 – 15 minutes, until firm on top. These dumplins are quite delicate, so spoon them carefully into each bowl before ladling the soup around them.